Steamboat Springs Publishing, 9780997200324, 256pp. You know when you've had a great nurse ... you can feel it! Juliana Adams has lived her dream of being a nurse for 50 years. Her stories are stunning and startling; raw and revealing; heart wrenching and heart soaring. In her eye-opening experiences, she provides a deeper perspective ... to always look beyond the diagnosis ... because every nurse is more than just a nurse! The Joy of Nursing: Reclaiming Our Nobility is provocative and riveting as the stories from new nurse to intuitive experienced nurse unfold. Far more than a memoir it is a rich journey from novice to expert, a concept with historical roots for all who enter this profession. For the currently practicing nurse, The Joy of Nursing will resonate with you. What Juliana learned about herself and her profession created a foundation of practicing nursing that resulted in a far deeper sense of joy. The Joy of Nursing will give you hope. For those who feel the call to become a nurse, you will see yourself in Juliana's innocence and desire to be the best nurse possible. This is a beautiful place to begin your life as a nurse ... and to carry with you throughout your career. Nurses have the knowledge, tenacity and creativity to ensure that the continued sacredness of the nurse-patient relationship endures. The Joy of Nursing will inspire you to live your nursing dream. She shares stories, her insights, and her dedication to nursing are exactly what the overwhelmed, disillusioned, innocent and anyone entering nursing need. If you are a practicing nurse, you will rejoice and rediscover your joy of and in nursing. If you feel the call to be a nurse, you will be encouraged to become part of this exciting profession. If you are disenchanted, you will uncover novel approaches for feeling valued and reconnected to the organization. If you know someone in nursing, you will celebrate their dedication to the patients and families they care for. Get ready to rekindle the nursing spirit that is the essence of healing care for both patient and self. Discover Juliana Adams Camelot Nursing! Juliana Adams, BSN, MSN, MA is dedicated to the advancement of the nursing profession and is actively engaged in how nursing care is delivered. She is an author, speaker and film maker. In 2012 she produced the film Exposure, Reclaiming the Nobility of Nursing. This film led her to seek a greater understanding of the concept of nobility within nursing. What began as a metaphor of her own exposure to life and nursing, led her to write The Joy of Nursing: Reclaiming Our Nobility. Juliana has experienced many diverse environments; having worked in ICU’s, ER’s, Ambulatory Care, research, nursing leadership and as an entrepreneur. All contributed to her global perspective of nursing. She is an English as a Second Language (ESL) instructor who marvels at how her students, similar to the many patients she has cared for, enrich her life. Juliana personally believes that if everyone supported one person that needed assistance, it would result in having individual and societal needs met on a level that would far exceed our expectations. The gift of one’s self sows the seeds for all of humanity to heal. This memoir of life in the emergency room takes an uplifting view of nursing as a profession—one which carries its own distinctive light. The Joy of Nursing: Reclaiming Our Nobility is a candid, moving career memoir by Juliana Adams that examines her fifty years as an RN. Framed by reflections on Florence Nightingale and the nursing industry, the heart of the book lies in a Denver hospital ER, where humanity meets in visceral, sometimes humorous, often bewildering moments, all of which are met with admirable strength. An impassioned view of the healing arts examines the patient-nurse exchange as one that involves advocacy, care, and most essentially, love. Adams’s account follows her path from wide-eyed idealism as a novice in the ICU to wisdom earned through the rigors of working at Denver General. A place where patients include the underprivileged, the destitute, and those whose injuries inspire reflection on the violence people inflict on each other, the setting is brought to life through accounts of staff members pulling together. Rather than inuring the author, witnessing trauma reminds her of the call to remain fully present. Even the treatment of perpetrators, such as drunk drivers, allows for lessons in avoiding judgment. The ability to search for good in an urban ER lets the work rise above conversations that focus on a community’s socioeconomic ills. Everyone is equalized by the reality that illness and injury can, and will, eventually befall everyone; it is this sense of connectivity and empathy that drives the book’s message. Less dramatic but equally thoughtful scenes depict the staff’s efforts to build a clothing boutique for patients who arrive in need—an unusual, necessary topic that outsiders may not consider. Especially searing moments include descriptions of a battered woman who begins to miscarry in the waiting room, the death of a feverish child, and a night on which several victims of sexual assault appear. Incidents are thoughtfully recounted, emphasizing the ways in which nursing demands resolve to allow others as much dignity as possible in their vulnerable moments, and to participate, if only briefly, in unthinkable struggles. A few intriguing threads, including time spent nursing in Germany, are mentioned in passing, though they could broaden the topic by serving as contrasts to the Denver ER. The concluding section turns away from personal recollections toward the increasing bureaucracy in hospitals. An encouraging voice provides suggestions for nurses who feel burdened to guide them back to the original passion that lead them to their profession. Prose remains sharp throughout. 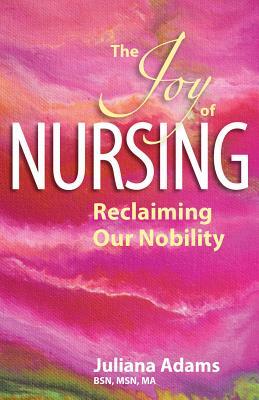 The Joy of Nursing: Reclaiming Our Nobility takes an uplifting view of a calling that was once regarded as a lesser role in medicine, proving that it is every bit as critical. Nurses become more than intermediaries between doctors, patients, and families; they carry their own distinctive light. A veteran R.N. for 50 years, Juliana Adams will say one gets the calling to be a nurse "if you're lucky." At one time or another, most people will have come in contact with a nurse, whether because they have been sick or injured, or a have been with someone who is. It's often their dedication, touch, and connectedness one remembers. The "bad" nurses will be remembered, too--the ones who made you feel uncared for, unimportant, invisible. THE JOY OF NURSING: Reclaiming Our Nobility (Steamboat Springs Publishing, May 2016) by Juliana Adams, R.N., M.S.N., M.A. is about the author's journey to be the best nurse possible, challenges in the profession, reevaluating her concept of nobility, and so much more. The stories are often raw, unfiltered, and revealing in nature, but done in a tasteful way in which the beginning (or aspiring nurse) can get a stunning glimpse of what the profession is really like. From her first job as a graduate nurse at a more cushy hospital to one in a grittier E.R. (Denver General), through administration/management, going back to school, and speaking/advocacy, Juliana will take your hand through the bowels of critical care nursing and help you rekindle your nursing spirit, reinforce your decision, and just be a gentle hand to lead the way.